Keep all your essentials organized in these space-saving, expandable packing cubes and bags. In the olden days, our ancestors would travel with just the clothes on their backs, and maybe a spare harmonica. Today, we have shoes for gym-ing, sightseeing, and dinner. Many lotions and creams. Important documents. And gizmos—so many gizmos. 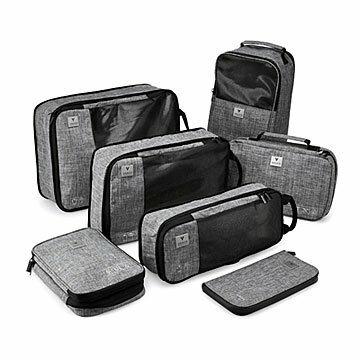 Keep it all organized in this space-saving set of seven expandable packing cubes and bags (we've detailed each one below). Each is marked on the outside, so you know what goes where, and they're constructed from durable, water-resistant fabric—because you're going places. Made in China. — Small, medium, and large expandable clothing bags for everything from trousers to ties. — Shoe bag made of waterproof, odor-absorbing material. Includes pockets for socks and slippers. — Toiletries bag with plenty of pockets and compartments, a hook, and waterproof zipper. — Electronics bag with pockets and compartments for chargers, tablets, and cords. — Document wallet with RFID security for credit cards, tickets, passport, and cash. He loves the simplicity and ease of staying organized with this travel set.